I don’t know about you, but I find exfoliators to be a very important element in my skincare regime. Balancing the right level of exfoliating with gentle cleansing can be tricky though as some exfoliators tend to fall on one side or the other - really rough and harsh on the skin or cleansing but not even slightly exfoliating. Step up: Huygens Exfoliating Cream. The Huygens Exfoliating Cream is a 98.9% natural facial scrub that contains rice powder particles as an exfoliator. It also includes nourishing sesame oil and the antioxidant green tea. 72.9% of the ingredients are also produce of organic farming. It claims to leave the skin looking illuminated, healthy, fresh and feeling soft. I received my 10ml miniature in my August Birchbox and as I stated on my box review I had too much to say about this Exfoliating Cream to fit into a small section in that post, resulting in this full-length review. The 50ml full-size comes packaged in a white, screw-cap jar with a pale green stripe around the middle containing company and product information. Apply a small amount of product to wet skin, massage in small circles and rinse. Huygens also say on their website that you can leave it on the face for a few minutes before rinsing too. 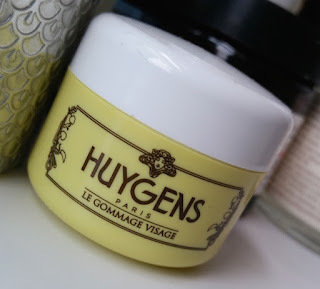 There is something about French skincare; they always seem to do it best, and with that said, Huygens' Exfoliating Cream doesn't disappoint, that's for sure! First thing's first - the smell. The scent of this product does something to me. I absolutely love it! It is so clean but zingy at the same time, just the kind of scent I prefer in my skincare products. Obviously that factor is down to everybody’s personal preference, but I thought that I would give it a mention. Putting that aside though, let’s get more honest - the most important part is the results. I find that the skin is left feeling super soft, looking smooth and much brighter. Not only that, but with continued use, your skin looks happier and healthier. You’re left with a nice glow. A luminous kind of glow. The balance of this exfoliator is perfect. It’s equally cleansing and exfoliating, a great harmony that provides the exact results that you want and that your skin needs. In regards to removal, I find that it doesn’t rinse as easily as a regular face wash would and it does take more effort to remove all of it, but it’s not an extortionate amount of extra time and it isn’t a bad thing. Usually around this part of my reviews I discuss whatever negative aspects there are with the product in question, but for this Exfoliating Cream I am genuinely stumped. I guess the only bad part about it is when it runs out. That is truly the highest recommendation that I could give a product. You know you have discovered a great product when you find yourself to be genuinely excited about using it. Washing your face suddenly becomes something that you're looking forward to purely so you can use it again. That’s how I feel about using this Exfoliating Cream by Huygens. You can purchase a jar of Huygens Exfoliating Cream for £17.90/50ml from Birchbox or €19,90/50ml from Huygens. 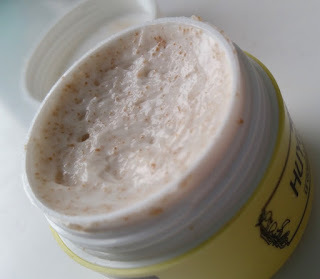 What are your thoughts on the Huygens Exfoliating Cream? What's your favourite exfoliator?